Through 16 games, the Red Sox' most consistent starting pitcher is their number-five starter who also happens to throw the most inconsistent pitch in baseball: the knuckleball. You read that Wright. It's Steven Wright. I called this one from the beginning. Since the start of last season, he has a 3.52 ERA in 92 innings. He has also allowed two or fewer runs in each of his past seven starts going all the way back to July 25, 2015. That's the longest active streak in the American League. He also has a 2.06 ERA during that stretch. With regard to this year, he lost his first two starts due to an incredible lack of run support but finally won his first game last night. He leads this starting staff in ERA at 1.40. 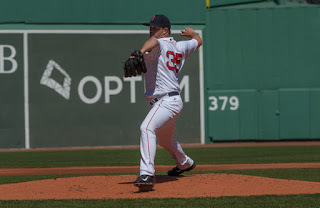 Steven Wright's 1.40 ERA is the 5th best in the AL and 12th best in the Majors. That's right guys: a pitcher making $515,000 has not only been your teams most consistent starter, but also your best one. And that guy David Price who's making $212 million currently has a 7.06 ERA (I know, it's the beginning of the season and he will find his groove). With Wright pitching as well as he has been, and with his dazzling knuckler, the question then becomes does he stay in the rotation when everyone is healthy? Yes, he absolutely has to. I couldn't care less about him being a number 5 starter: if he's your best guy, you don't automatically push him off the edge when Eduardo Rodriguez gets back or if Henry Owens throws a gem on Sunday. If Owens can throw a quality-start against the Houston Astros, he'll most likely take Joe Kelly's spot in the rotation since Kelly is injured and has an ERA of 9.35 to start the season. Throw Kelly in the bullpen when he comes back: I don't really care at this point. This is his second straight April in-which he has stunk so I think it's time to just give him the boot, at least for now, from the starting rotation. When E-Rod comes back, whenever that'll be (God only knows), keep Wright on and put Clay Buchholz somewhere else. I think it's logical to believe that once the ROD gets back, Buchholz will have some sort of injury to his elbow or his back or his tricep. It's Clay for you. The bottom line is this: through 16 games, no one has earned their spot more than Steven Wright. No one deserves to stay more than Wright as well. And yeah, he's a knuckleballer who makes MLB's version of chump change.